This page is a continuation of my About Me page. I never thought that page would have such an impact, but I get more feedback about that page than about all other parts of this website put together! Many people write to thank me for the information they get from it. What can I say? Thank you so much for taking the time to let me know. I appreciate the kind words and I'm glad I'm able to provide information about activities and events happening here in our town. I also receive many emails asking me more questions about this website and about SBI. Obviously, there is a lot of curiosity about the system, and apparently I didn't do a good enough job when I told you about it, because the questions are always the same. Some people come right out and ask, "How much are you making and how long did it take?" I currently own two SBI websites: Skincare Answers (my first site, started in 2008) and this Colonial Beach Virginia Attractions website. The first one has taken a backseat and I haven't done much with it yet because there's so much going on at the beach! I'm receiving record numbers of visitors and page views from over 105 different countries each and every month. I receive an Adsense (those "Ads by Goooogle") check every month and I also have income from several other sources. There are other advertisers, and I make money from book and souvenir sales. I don't sell those myself. I just let people know where they can buy them, and if someone likes the product and buys it I get a small commission. Had I spent all my time on only one site my income would have grown faster in the beginning. A website is something that requires a lot of work up-front and pays off bigtime later on down the road. Editing two websites meant that I spent most of my time doing the initial work that doesn't bring an immediate return, but it also means that another couple of years down the road I will make a lot more than if I had only one site. What's most important here is that my income is steadily growing, day after day, month after month, whether I work on the websites or not. When I do a lot of work, it grows much faster, but it grows even when I take a break. I earn money while I travel, I earn money while I play at the beach, I earn money while I watch TV. It's pretty amazing. That is probably the most common question I receive from readers. "Success is sweet! It’s secret is sweat!" While it does take time, hard work and commitment to build a successful website, the return is well worth the price you pay in the beginning. The easy part comes once the site is up and running and it's pretty much on auto-pilot. Time, hard work, commitment. That's all it takes. It does not require exceptional writing skills, or technical knowledge, or computer or website experience. Nothing. You will initially have to learn a whole lot, but that learning is part of SBI. You will be expertly guided through the whole process. Anyone who's willing to learn and work hard can do this, no matter their background. So if that's what you wondered, then the answer is yes. It really is that easy. And, if I can do it, you can do it! When I start a new site, I work on it like a fiend! I do research, I compose pages, I search for photos to place on that page. Most importantly, I follow the tried and true program outlined by SBI. Probably a few hours a day, at least. After that, I'll keep building pages here and there, and I keep the blog on the site updated with pertinent information. It sounds interesting, but I have no clue what I could make a website about. One of the first things that SBI teaches you is how to select a profitable topic. There are no general rules. Everybody is different so this is an individual decision. It helps to make a site on something you're passionate about. SBI has brainstorming tools which you can use to pinpoint ideas and to research them to see if there is enough public interest in a topic, how much competition there is in that topic, and if there is money to be made. Selecting a topic for your website is the most important step in the whole process, and it shouldn't be done without the help of SBI anyway. Don't know what to build your site about? That's OK! "Six months after my site went live, I received an email from the Editor-In-Chief of a publishing house in New York wanting to know if I'd be interested in writing articles for their hair magazines." "I do my business successfully because I use Site Built It!. And I'll be the first to admit I don't even use all the features and capabilities of SBI to their full extent. SBI is such a powerful tool you just have to "kind of" know how to use it to be successful." 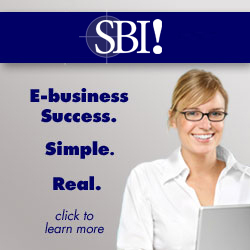 Try SBI - because if I can do this, you can, too! Return to the About Me page.